Universally acclaimed as the maestro of horror and the morbid, Edgar Allan Poe's dark gift has for more than a century and a half set the standard for the genre. 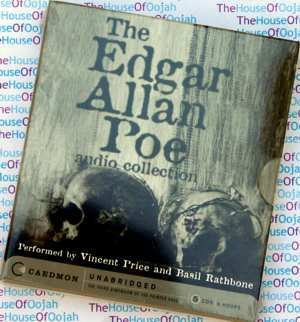 Here, 20 of Poe's most chilling stories and poems are performed by two of his most brilliant interpreters: Vincent Price and Basil Rathbone. Included are The Tell-Tale Heart, The Pit and the Pendulum, The Cask of Amontillado, The Fall of the House of Usher, Bells, The Gold Bug, The Raven, Annabel Lee, The Black Cat, Berenice, The Imp of the Perverse, The Masque of the Red Death, and many more! Edgar Allan Poe (January 19, 1809 – October 7, 1849) was an American poet, short-story writer, editor and literary critic, and is considered part of the American Romantic Movement. Best known for his tales of mystery and the macabre, Poe was one of the earliest American practitioners of the short story and is considered the inventor of the detective-fiction genre. He is further credited with contributing to the emerging genre of science fiction. He was the first well-known American writer to try to earn a living through writing alone, resulting in a financially difficult life and career. He was born as Edgar Poe in Boston, Massachusetts; his parents died when he was young. Poe was taken in by John and Frances Allan, of Richmond, Virginia, but they never formally adopted him. After spending a short period at the University of Virginia and briefly attempting a military career, Poe parted ways with the Allans. Poe's publishing career began humbly, with an anonymous collection of poems, Tamerlane and Other Poems (1827), credited only to "a Bostonian". Poe switched his focus to prose and spent the next several years working for literary journals and periodicals, becoming known for his own style of literary criticism. His work forced him to move between several cities, including Baltimore, Philadelphia, and New York City. In Baltimore in 1835, he married Virginia Clemm, his 13-year-old cousin. In January 1845, Poe published his poem "The Raven" to instant success. His wife died of tuberculosis two years later. He began planning to produce his own journal, The Penn (later renamed The Stylus), though he died before it could be produced. On October 7, 1849, at age 40, Poe died in Baltimore; the cause of his death is unknown and has been variously attributed to alcohol, brain congestion, cholera, drugs, heart disease, rabies, suicide, tuberculosis, and other agents. Poe and his works influenced literature in the United States and around the world, as well as in specialized fields, such as cosmology and cryptography. Poe and his work appear throughout popular culture in literature, music, films, and television. A number of his homes are dedicated museums today. After his brother's death, Poe began more earnest attempts to start his career as a writer. He chose a difficult time in American publishing to do so. He was the first well-known American to try to live by writing alone and was hampered by the lack of an international copyright law. Publishers often pirated copies of British works rather than paying for new work by Americans. The industry was also particularly hurt by the Panic of 1837. Despite a booming growth in American periodicals around this time period, fueled in part by new technology, many did not last beyond a few issues and publishers often refused to pay their writers or paid them much later than they promised.Poe, throughout his attempts at pursuing a successful literary career, would be forced to constantly make humiliating pleas for money and other assistance for the rest of his life.After his early attempts at poetry, Poe had turned his attention to prose. He placed a few stories with a Philadelphia publication and began work on his only drama, Politian. The Saturday Visitor, a Baltimore paper, awarded Poe a prize in October 1833 for his short story "MS. Found in a Bottle". The story brought him to the attention of John P. Kennedy, a Baltimorian of considerable means. He helped Poe place some of his stories, and introduced him to Thomas W. White, editor of the Southern Literary Messenger in Richmond. Edgar Allan Poe became assistant editor of the periodical in August 1835; however, within a few weeks, he was discharged after being found drunk repeatedly. Returning to Baltimore, Edgar Allan Poe secretly married Virginia, his cousin, on September 22, 1835. She was 13 at the time, though she is listed on the marriage certificate as being 21. Reinstated by White after promising good behavior, Edgar Allan Poe went back to Richmond with Virginia and her mother. He remained at the Messenger until January 1837. During this period, its circulation increased from 700 to 3,500. He published several poems, book reviews, criticism, and stories in the paper. On May 16, 1836, he had a second wedding ceremony in Richmond with Virginia Clemm, this time in public. The Narrative of Arthur Gordon Pym was published and widely reviewed in 1838. In the summer of 1839, Edgar Allan Poe became assistant editor of Burton's Gentleman's Magazine. He published numerous articles, stories, and reviews, enhancing his reputation as a trenchant critic that he had established at the Southern Literary Messenger. Also in 1839, the collection Tales of the Grotesque and Arabesque was published in two volumes, though he made little money off of it and it received mixed reviews. Edgar Allan Poe left Burton's after about a year and found a position as assistant at Graham's Magazine. In June 1840, Edgar Allan Poe published a prospectus announcing his intentions to start his own journal, The Stylus. Originally, Edgar Allan Poe intended to call the journal The Penn, as it would have been based in Philadelphia, Pennsylvania. In the June 6, 1840 issue of Philadelphia's Saturday Evening Post, Edgar Allan Poe bought advertising space for his prospectus: "Prospectus of the Penn Magazine, a Monthly Literary journal to be edited and published in the city of Philadelphia by Edgar A. Edgar Allan Poe." The journal would never be produced before Edgar Allan Poe's death. Around this time, he attempted to secure a position with the Tyler administration, claiming he was a member of the Whig Party. He hoped to be appointed to the Custom House in Philadelphia with help from President Tyler's son Robert, an acquaintance of Edgar Allan Poe's friend Frederick Thomas.Poe failed to show up for a meeting with Thomas to discuss the appointment in mid-September 1842, claiming to be sick, though Thomas believed he was drunk.Though he was promised an appointment, all positions were filled by others. One evening in January 1842, Virginia showed the first signs of consumption, now known as tuberculosis, while singing and playing the piano. Edgar Allan Poe described it as breaking a blood vessel in her throat.She only partially recovered. Edgar Allan Poe began to drink more heavily under the stress of Virginia's illness. He left Graham's and attempted to find a new position, for a time angling for a government post. He returned to New York, where he worked briefly at the Evening Mirror before becoming editor of the Broadway Journal and, later, sole owner. There he alienated himself from other writers by publicly accusing Henry Wadsworth Longfellow of plagiarism, though Longfellow never responded.On January 29, 1845, his poem "The Raven" appeared in the Evening Mirror and became a popular sensation. Though it made Edgar Allan Poe a household name almost instantly, he was paid only for its publication. Edgar Allan Poe spent the last few years of his life in a small cottage in the Bronx, New York. The Broadway Journal failed in 1846. Edgar Allan Poe moved to a cottage in the Fordham section of The Bronx, New York. That home, known today as the "Poe Cottage", is on the southeast corner of the Grand Concourse and Kingsbridge Road. Virginia died there on January 30, 1847. Biographers and critics often suggest Edgar Allan Poe's frequent theme of the "death of a beautiful woman" stems from the repeated loss of women throughout his life, including his wife. Increasingly unstable after his wife's death, Edgar Allan Poe attempted to court the poet Sarah Helen Whitman, who lived in Providence, Rhode Island. Their engagement failed, purportedly because of Edgar Allan Poe's drinking and erratic behavior. However, there is also strong evidence that Whitman's mother intervened and did much to derail their relationship. Edgar Allan Poe then returned to Richmond and resumed a relationship with a childhood sweetheart, Sarah Elmira Royster.